I rarely read non-fiction, preferring instead to lose myself in a fictional world and with fictional characters. But historical non-fiction is one area that I do enjoy. 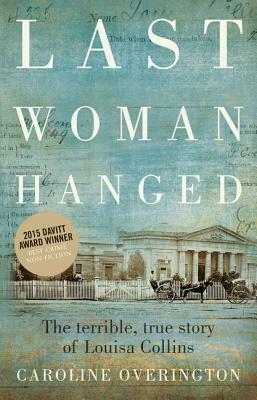 As part of the Australian Author Challenge in my Aussie Goodreads group and the Eclectic Reader’s challenge, I chose Caroline Overington‘s re-telling of the Last Woman Hanged. Louisa Collins first husband, Charles Andrews, was a butcher. Louisa was young (by modern standards) at the time of her marriage and did so at her mother’s urging. She remained married to Charles for close to twenty years and bore him many children before he died suddenly. The doctor determined the cause of death acute gastritis. Louisa buried Charles and quickly remarried her lover, Michael Collins. She was four months pregnant at the time of the second marriage. After burying their young child who fell ill and died, Michael died in similar circumstances, displaying similar symptoms to Louisa’s first husband, Charles. His death was ruled to be by arsenical poisoning. Upon suspicions of the doctor tending Michael, and some of the Collins’ neighbours, Louisa was arrested for the murder of Michael. She sat through three separate trials, two for the murder of Michael and one for the murder of Charles, in which none of the jurors could reach a unanimous verdict based on the lack of evidence. Her children were forced to give evidence at the trials against her. A great deal of emphasis was paid to the evidence provided by Louisa’s eleven year old daughter, May. A fourth trial was conducted in which a conviction was finally obtained for the murder of Michael Collins. All of the jurors in each trial were picked from a small pool of privileged men. Louisa was sentenced to die, but maintained her innocence until she became the last woman hanged in New South Wales. Unlike Dr Martin, who had not at any point suspected Charles of being poisoned, Dr Marshall had by this stage begun to wonder whether Michael had taken — or been given — something toxic. Regardless of whether or not Louisa was guilty of killing none, one, or both of her husbands (there is evidence that both men were exposed to arsenic through their employment and this is delved into in detail in the book), Louisa wasn’t given a fair trial and was made “an example of” by a group of powerful men. Three juries found her innocent; there wasn’t enough evidence to support a conviction and yet the crown pursued her relentlessly until they eventually got the result they wanted. I would have liked the Last Woman Hanged, to have discussed this aspect of the background behind the trial a little further, however, given it is likely that not a lot of this history was recorded, or has been lost, it may have been too difficult for the author to do so. Last Woman Hanged also reveals the aftermath of Louisa’s hanging and how it impacted both her children, grandchildren and beyond, along with others relevant to her conviction and hanging. In addition, it discusses why Louisa’s hanging was so important. Spurred into action by Louisa’s sentence, many of the first suffragettes in Australia joined in an attempt to save her. Many made it clear that even if Louisa was guilty, there wasn’t enough evidence to convict her, that no women were present on any of the juries, and that women were not afforded the same voice in society as men. It eventually led, along with other important issues affecting women at that time in our history, to obtaining the right to vote. In 1902, Australia was the second country in the world, after New Zealand, to allow all women the right to vote in federal elections. As much as this history is fascinating, I did find the Last Woman Hanged to be a little repetitive in places and veer slightly of course to discuss the events relating to people on the “fringes” of the trial (for lack of a better description). There are times I would have loved to know more of what Louisa thought of her predicament. Again, this wasn’t necessarily possible and I believe the author did her best in conveying it though observer’s notes recorded at the time. I rated Last Woman Hanged 3 Stars on review sites that require a star grading. Additional note unrelated to the book review but for interest purposes: In 1962 the universal right to vote was granted to the indigenous peoples of Australia in federal, state, and territory elections. I realise this book review doesn’t deal with the indigenous vote or the role of indigenous people in society at the period in time Louisa was hanged, but I felt it important to include here.